﻿Customize a holiday feast for your feathered guests. 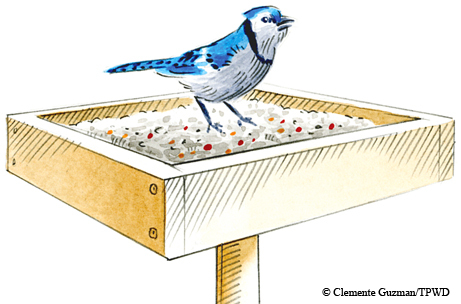 ﻿﻿﻿﻿Take the holiday spirit outdoors this year and create a backyard bird buffet. The summer drought took a devastating toll on seed- and fruit-producing plants, and now birds are on the lookout for food. You can help supplement their diet by setting up bird feeders until new food sources start sprouting in spring. Your good deed can be as much fun as holiday gatherings. Plan a guest list, menu and place settings (bird feeders), then sit back and enjoy the party! To attract common backyard birds like cardinals, chickadees and titmice, try providing sunflower seeds. Black oil sunflower seeds or safflower seeds (a bit smaller, harder and white) are best. You can also use the larger striped sunflower seeds, but larger seeds also attract larger birds like doves, pigeons and grackles. While all birds have a place in our backyard, doves and grackles can take over your bird feeders and scare away smaller, prettier birds like cardinals. Try a mix of bird feeder types and seeds to meet the needs of all the birds in your yard. Nearly any kind of bird feeder works with sunflower or safflower seeds — tube feeders, platform feeders or post feeders. Smaller birds such as goldfinches and house finches (and chickadees and titmice) prefer thistle seed. This small, black seed works best with tube-shaped feeders that have slits for the seeds and perches suitable for these active birds. For a “come one, come all” open house, try a platform feeder, which isn’t much more than a flat tray on a pole in the ground. An old hubcap or large plastic lid can work great, but be sure to make a few small holes so that rain can drain from the pan. Spread corn, peanuts and seeds of all kinds across the platform. Sit back and watch a mix of birds and squirrels gather to find their favorite food. Birdseed mix that includes inexpensive seeds will attract a wide variety of birds, but your feeders may be dominated by doves, grackles, house sparrows and pigeons. To counter this, use tube feeders or feeders that have screens or lattices that limit large birds. Avoid feeders that have large bases or large tops that the bigger birds can perch on. Squirrels can pose a problem, often perching on a feeder, keeping birds away and dumping a lot of seed. Bird feeders with spring-tensioned openings or other mechanisms can be almost squirrel-proof. You can provide squirrel-friendly platform feeders, corncob feeders or on-the-ground feeders, then supplement with tube feeders that favor small songbirds. Children can fashion bird feeders from pine cones, large juice cartons or milk jugs. Roll an open pine cone in a mix of peanut butter and vegetable shortening. Then roll the pine cone in birdseed, add a string to the top, tie it to a branch and watch the birds enjoy the fruits of your labor! Speaking of fruit, not all our backyard birds are seed eaters. Some, like robins and mockingbirds, prefer fruits and berries. Some bird mixes include dried fruit, or you can put a few raisins, grapes or berries on a separate tray feeder. Clean your bird feeders every few weeks, especially if it rains and the seeds get wet. This will protect birds from fungus and germs. Don’t forget those natural bird feeders — plants! Some top-notch plants for attracting birds to your yard include mulberry trees, sunflowers, lantana, the various salvias and native grasses like little bluestem, Lindheimer muhly or indiangrass. Several of these flowering plants also provide nectar for butterflies and hummingbirds, as well as fruit and seeds for birds. This year, we allowed some wild sunflowers to come up in our vegetable garden (only a few! ), and we were rewarded with more lesser goldfinches than we’ve seen in years. So consider plants to provide year-round food sources for wild friends. Important: Remember that birds need water, especially during a drought. A simple birdbath or saucer with an inch or two of water will dramatically increase the number of birds visiting your yard, as they look for both drinking water and a place to wash off the dust.